The Trail of Painted Ponies is devoted to supporting students, educators and schools because we believe in the power of art! 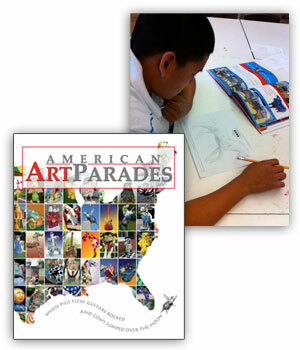 Arts education has been proven to increase academic success in science, math and language arts. We believe that the arts sharpen creative and critical thinking skills. In fact, studies have demonstrated that these skills will be essential to students who will soon become the next generation of entrepreneurs. As the global economy continues to grow at an unprecedented rate, students who are able to harness their creativity will become the super-stars of American and international business. We believe that the future belongs to the next generation of creative thinkers and we encourage everyone to support the arts in schools. To that end, we have developed educational partnerships with some exceptional schools, teachers and students. We would like to recognize Professor Jacek Fraczak from Missouri State University for inviting his Des 250 Techniques and Materials Illustration class to Paint Ponies that represent the great state of Missouri. We would also like to recognize Art Director Marie LaFrance from Fort Thomas High School in Fort Thomas, Arizona, for connecting her art students to The Trail by hosting a workshop in her classroom. If you are interested learning more about the various ways your school or class can partner with The Trail of Painted Ponies, contact us at: info@paintedponies.com. Near the edge of the breathtakingly beautiful Apache Indian Reservation in Southeastern Arizona, lies the historic town of Fort Thomas, home of Fort Thomas High School. This wonderful school is very fortunate to have a passionate art teacher named Ms. Marie LaFrance who insists on bringing the art world into her classroom so that her students can actually be part of the arts. Ms. LaFrance had invited her art students to paint Ponies on paper and she took the time to send us these Painted Ponies, along with a wonderful letter about art and inspiration. We were so impressed that she took the initiative to introduce The Trail of Painted Ponies to her students that we contacted her and offered to come down to teach a workshop for her art students. We spent a beautiful afternoon working with these accomplished high school students. We discussed the importance of the arts in education and we also encouraged each student to consider a career in the arts. From architects, artists, designers, film makers and musicians to photographers, writers, webmasters and so much more. We wanted each student to know that the world is waiting for the next generation of creative thinkers and problem solvers. The students in schools across America are the entrepreneurs of tomorrow and we want them to be prepared to contribute with their creativity! When the final bell rang, we took a look at all of the wonderful Painted Ponies that had been thoughtfully created by these outstanding art students and we were amazed at their artistic ability. In the coming weeks, we hope to feature some of their completed Painted Ponies to help inspire other teachers and students. Thank you, Ms. LaFrance and to all of the students from Fort Thomas High School for inviting us to your school and for joining us on this artistic trail ride.